French restaurants… If you’ve been to one, you know the drill. A coq au vin here, a haricot vert there and a use an alarming number of different words (emulsion, spume, froth) which all actually mean… foam. You usually know what to expect and what it will look like and it is not just the highstreet restaurants, even some of the best French restaurants fall guilty of the “Classics” that have been added for mass appeal. So imagine my delight, in a French restaurant that serves Provencal food from the home regions of its French owner, Pascal Aussignac with not a Duck à l’orange in sight. I give you Cigalon. I have previously reviewed the sister to this restaurant, the utterly outstanding Michelin star Club Gascon and this place, though less formal and experimental, remained true to its ingredients, its cooking and its food. No baked camembert here mon amis. Head Chef Julien Carlon and Chef Christophe Gravelot handpick their ingredients from suppliers from across the South of France and the UK. They would say that the cooking is classic provencal… “Côte de Veau, sauce Mentonaise and Panisses, Pieds et Paquets” etc. We had the chefs menu of 5 courses and wine pairing. To begin, we had the pea velouté with goat curd and mint. I will give you the nod now that this is served cold. I usually shy away from cold soups (don’t ever bring a gazpacho anywhere near me), but as this had the addition of goat curd, croutons and mint, it felt more like a very generously sauced dish than it did any sort of soup. For the next course, I opted for the Ham Hock Terrine with Quail Egg & Pickles. Why? Because Ham Hock and quails egg are always a winner. They created their own take on a piccalilli with pickles and little pickled cauliflowers. My guest had Baked Sardines with Pine Nuts, Lemon & Garlic. Whatever pre-conceived notions you have about these little guys, leave them in year 7 or whenever it was that you stopped being afraid of fish. He is also a guy with a fondness for big food portions and this worked really well for him. These are fabulous. Yes, yes they are a little boney, but frankly so is Kate Moss and both command the spotlight incredibly well in my book. 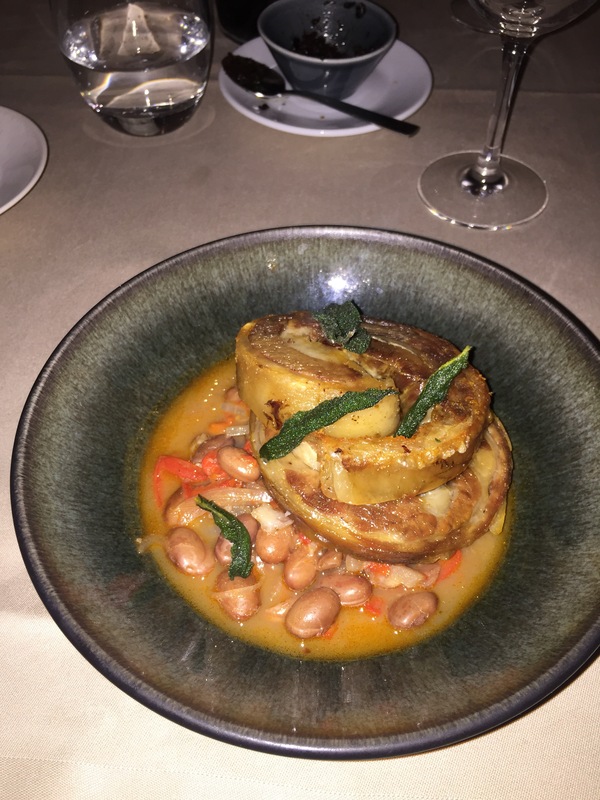 For the main, we had the Lamb Belly with borlotti beans, red peppers & sage. As a part Greek, Lamb is practically part of my soul. While shanks are super soft, they taste of far less than the belly and I would choose this cut any day. For dessert, we had the Ossau Irraty cheese with Pickled Rhubarb. As you know, I love this (sheep milk) cheese. Then we followed with both the Amaretti, Passion Fruit & Basil Cheesecake. The Cheesecake was super sweet with the rich flavour of the amaretti and I could have eaten 3 of them. (I know). FYI. When everyone wants to photograph the food, you know you’re on to a winner. The big surprise for me came with the Dark Chocolate Moelleux & Fennel Ice Cream. Why? Because I HATE FENNEL. Not even a little bit… I am vehemently opposed to fennel and see no reason to use it on anything. So, the surprise for me was how much I enjoyed the dish. It was enough that it didn’t taste entirely sweet, but certainly not enough to identify as …….fennel. The point is, French food and wine should never be predictable. Cigalon is proof that French cooking done well is imaginative, its different and tastes great. As the French would say…. Mangez bien.